The hype was justified, though - they've got it all right, and what's better, they don't flaunt it either. The folk-rock sound, the electric twelve-string is there, but mixed in with a batch of modern original songs to create a startlingly good debut album. The Byrds similarities are inescapable. 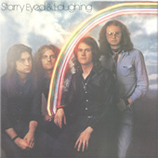 Starry Eyed and Laughing idolized the Byrds, took their name from 'Chimes of Freedom', and have developed similar airy harmonies and twelve-string pyrotechnics. When the Byrds evolved that sound originally, it was revolutionary, building off Beatles and Searchers groundwork but blazing new sonic trails, a subtle yet endlessly exciting mutation. Since then nobody's really captured it, certainly not CSNY or any of the other spinoffs, or even the Byrds themselves on their reunion. Starry Eyed and Laughing come closest, and their ringing guitars sound perfectly delightful. But where a strict copy band would fall into the pointless nostalgia category, Starry-Eyed and Laughing leave the ultimate impression of being an exciting new band, on their way up with unlimited potential.